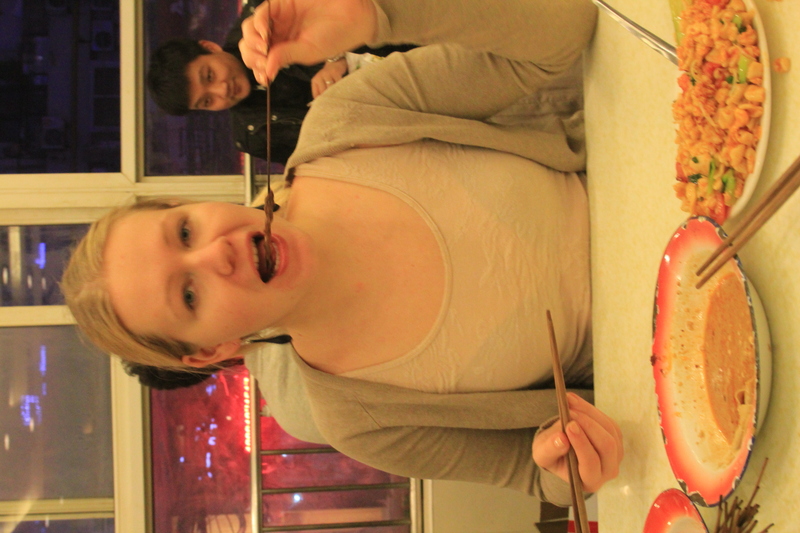 You are all invited to dinner with us yesterday at 9pm at Cao Chang Puo Chinese barbeque reastaurant. Calling the place a restaurant is quite ambitious, however the appearance does not matter, the food does. And the food is just wonderful. I do miss cooking for people and going to people’s houses for dinner or going to restaurants with friends. Consider this a virtual date. Virtual meaning in the virtual world. We have grown to be rather lazy when it comes to cooking and usually opt for a quick take away from one of the vendors on the street. This is usually noodles and some grilled sausages, chicken wings or other meat (maybe horse, maybe cow, maybe something else – it’s better not to know). 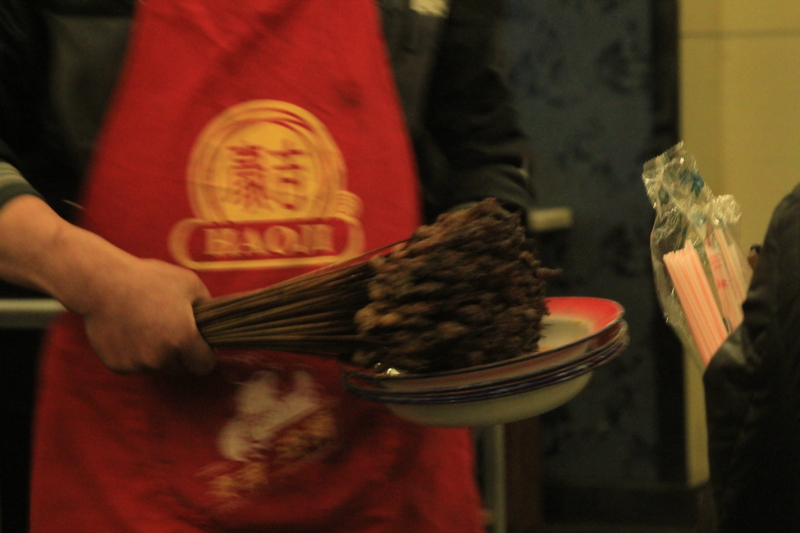 Xi’an is known for its barbeques. 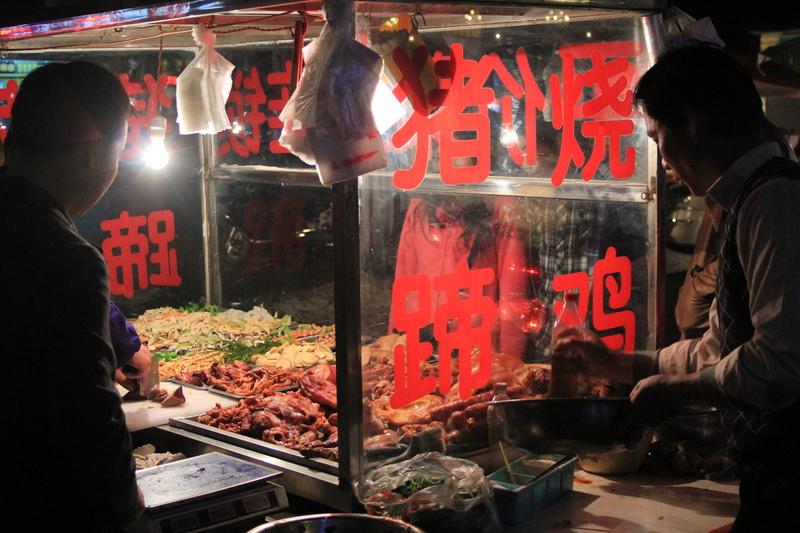 Our area – Cao Chang Puo – is known in Xi’an for its street food and barbeques. 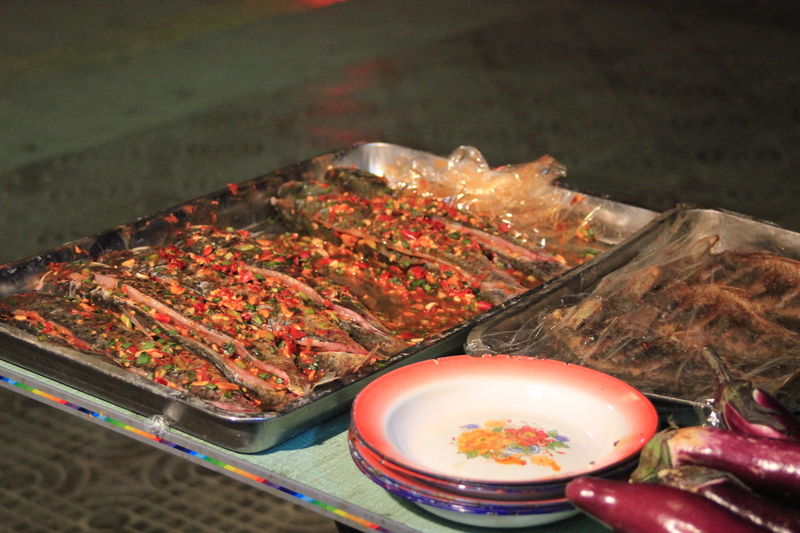 Everything that gets put on the little coal fuelled barbeque gets covered in Chinese five spice, tons of oil and chilli. 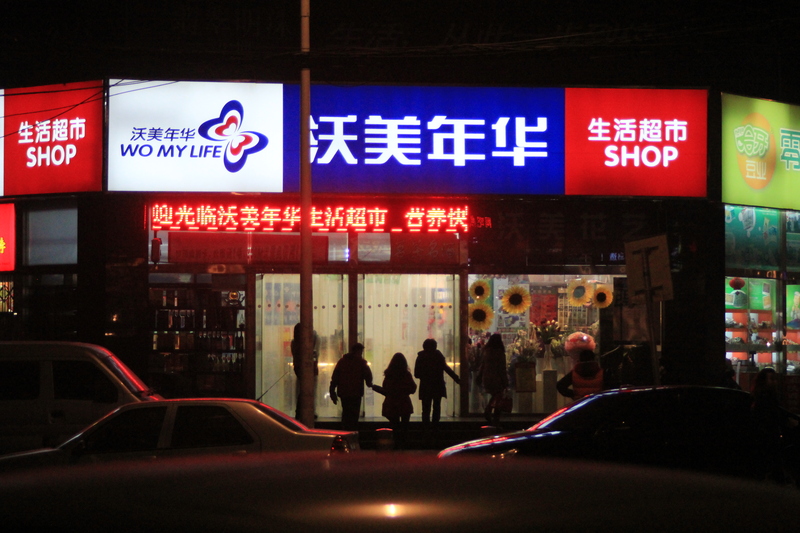 Yes, it is called Wo My Life and they are always playing Beyonce. 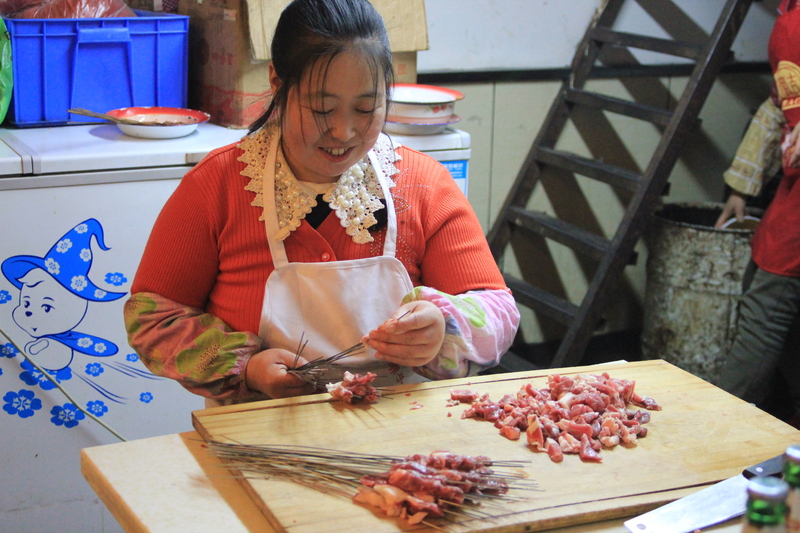 They sell some really nice Chinese sausage, which is like Estonian ham (keedusink). It looks very pink and probably has no meat or nutritional value, but it’s so tasty. I even used it to make kartulid ja vorstikaste. Felt like going back to school. 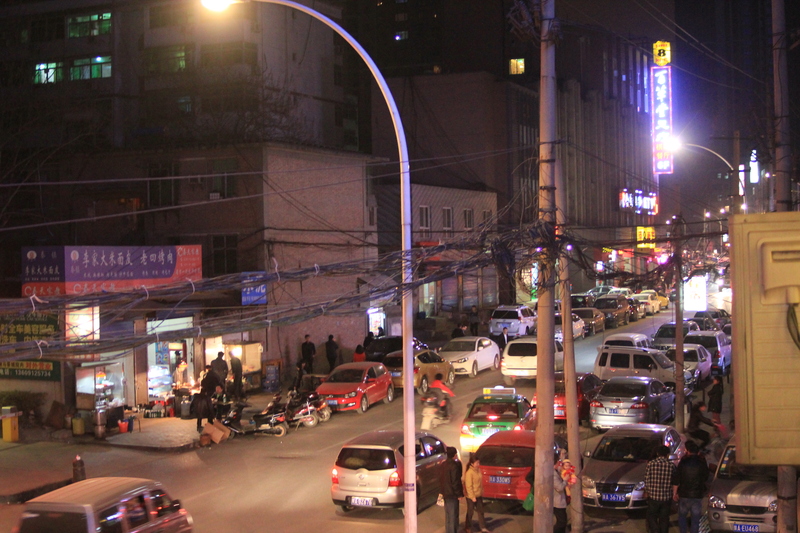 Once we’re past the supermarket, we cross a small yet chaotic road dodging taxis, motorbikes and other imaginatively put together vehicles and we get to this street. This is the street we go to find food. The restaurant we went to yesterday is just next to another favourite place, which serves green noodles. They are green because they have spinach in them. Or at least so we’re told. This is our restaurant outside. You don’t even have to sit down to eat, you can just get some take away barbeque and noodles. We decided to go and sit. 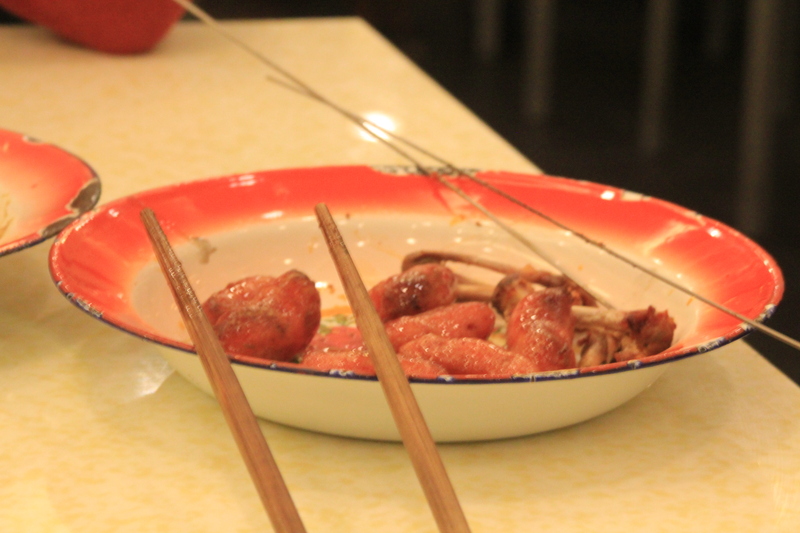 In Chinese barbeque all the meat is cut into really small pieces. This poor lady has to skewer these miniscule pieces of meat. You can buy meat from this guy, who occasionally comes around with different types of meat. You can ask him how many skewers you want and he will just leave them with you. Afterwards, the waitress will count the skewers and give you the bill. So on the menu last night was: a tofu dish whose name I don’t know how to spell, but it is tofu skins in peanut butter, garlic and chilli sauce. It is beautiful. 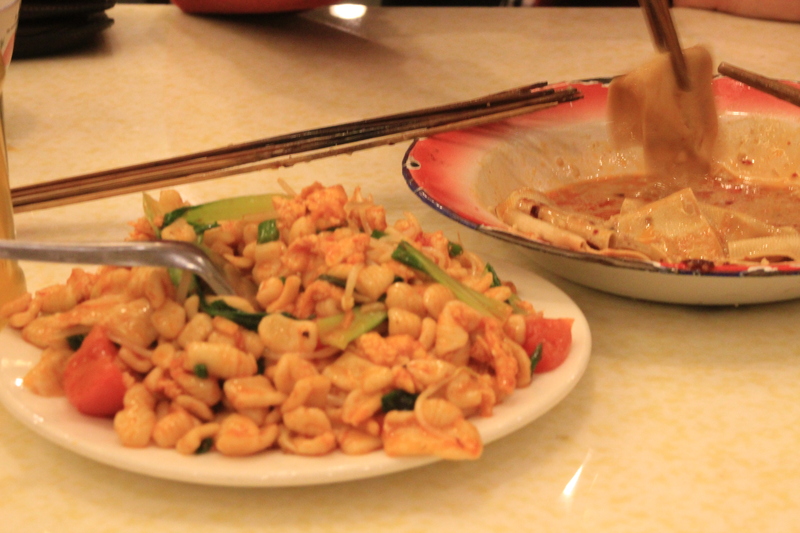 We also had some noodle type of things that remind me of a crossbreed between pasta and gnocchi. It’s little pieces of noodle cooked with tomatoes, bak choy, beansprouts and other things. Chicken wings are always a standard, but my favourite are these little sausages. They are slightly sweet and very tasty. We also had some mo, which means bread. 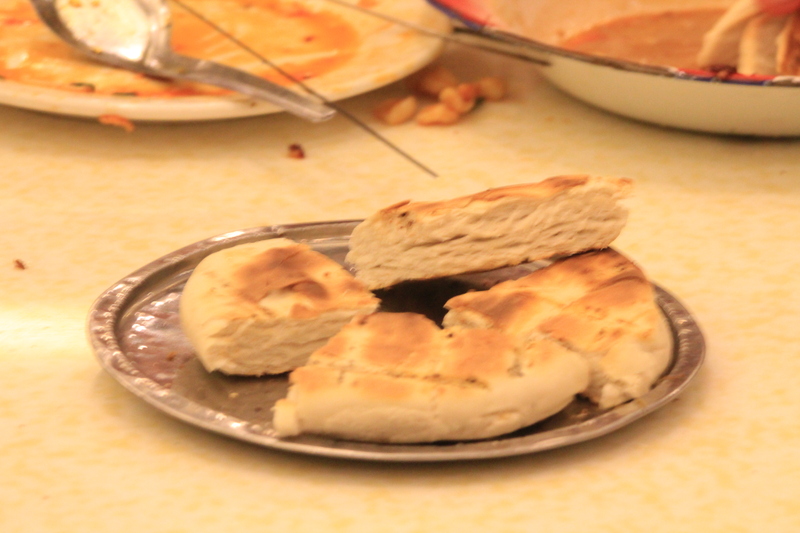 Bread in Xi’an is usually cooked in clay ovens, so it’s nice and crispy on the outside and soft inside. You can have the bread covered in oil and spices or just plain. 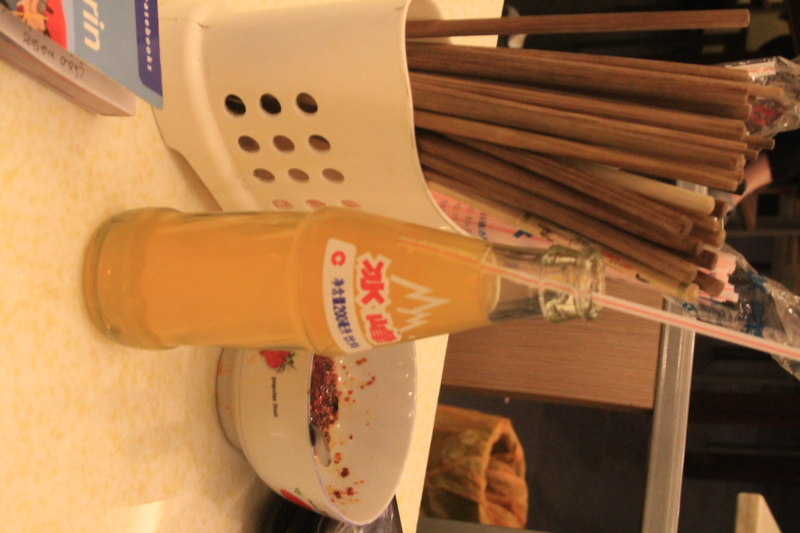 Xi’an is famous for a drink called Bing Fang (Ice Peak), which tastes just like Fanta. Apparently it makes you go orange if you drink too much of it and it’s banned in some areas, but I like it, so I don’t mind going a bit orange. 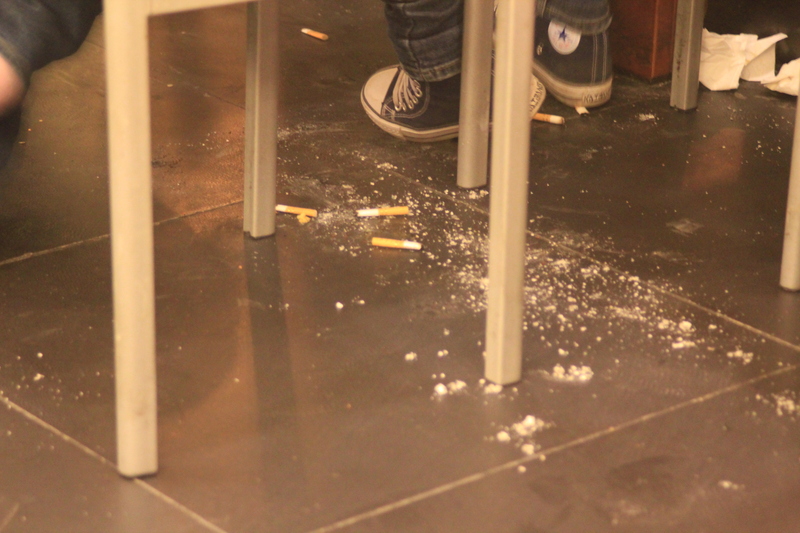 There are no ashtrays in the restaurant, so it’s ok to use the floor as one. It’s also OK to spit on the floor while you’re eating. 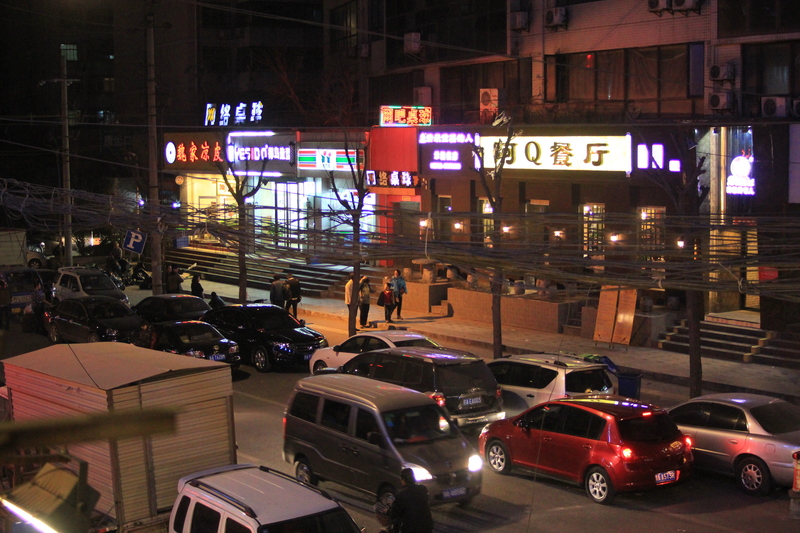 Chinese people do drink a lot. People usually buy a box of beer and finish the box while they eat. They always need to finish their drinks so as not to ‘lose face’. I often see drunk people holding each other up after a business meeting. It is a standard requirement here that if you go to a business meeting you have to drink, otherwise your company image will be tarnished. Another beautiful thing about this place is picture menu. 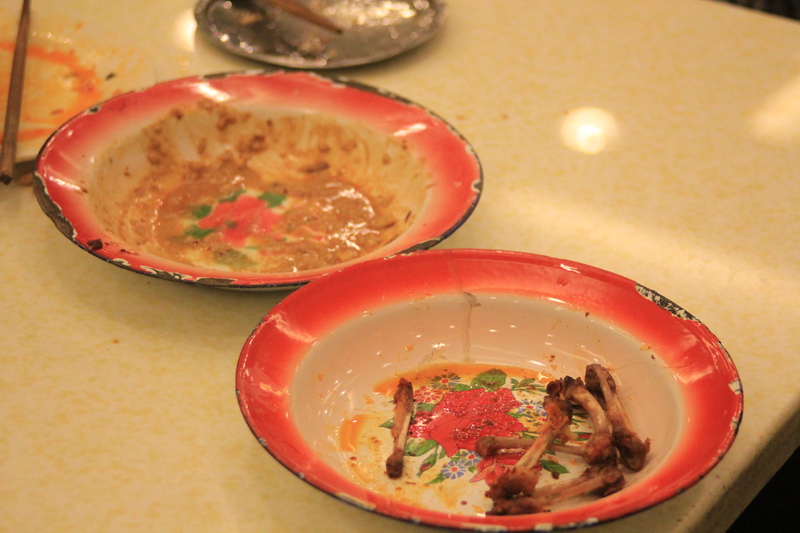 If there is no picture menu we just guess and say jiga (this one) and see what surprise they have in store for us. After dinner we politely thanked the waitresses and even said goodbye. They love it, because people don’t usually exchange courtesies here. Spring is now in full spring. The temperature today is getting up to 20s, the fountains have been switched on and people are starting to take off their coats and hats. Despite this, the water spraying truck still plays jingle bells and Christmas decorations in the form of cardboard Santas are still up in some shops and restaurants. Gangnam Style and Celine Dion provide a nice change to the Christmas tunes. 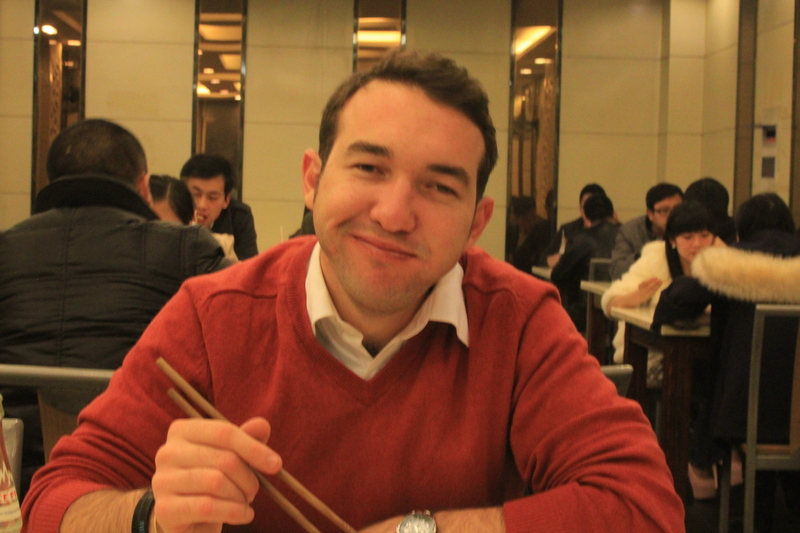 As of tomorrow I will be teaching at a Chinese state school for one day a week. I have no idea what to expect apart from a large class size. It will surely add to my Chinese experience. We have also started some extra teacher training, provided by our school and have also started with Chinese lessons. We joined the gym! We’ve only been once so far, but are planning to go again on Wednesday. It’s very decent and nice. Lots of different yoga classes and good equipment. Only mild staring, which is nice. I still haven’t found Nutella. This is sad. However, I ordered an espresso machine from a Chinese website and it has arrived. Now to find some decent coffee…. Our Chinese names: Dà wèi and Kǎi tè lín. I do hope some of you will be able to come and visit us so we can take you for a real life dinner adventure, hiking in the mountains, haggling at the Muslim quarter…..the list goes on. Tell us of news back home! Comrades, I can see China has been quite an adventure. I am always excited to read what’s happening. Keep on keeping on. Pamberi!!! Looks very delicious and you are having quite a wonderful adventure!